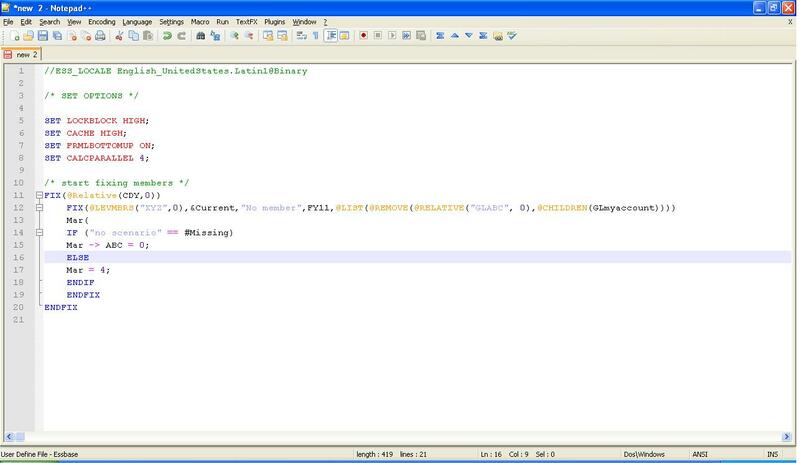 People who are using Notepad++ will be aware of the highlighting feature available for lot of languages. It’s much relief to work on Notepad++ because of the highlighting feature, when compared to other editors where the monotonous black prevail (notepad and editplus). There is in-built highlighting for more than 40 languages!!!!! I use it a lot because it makes life easy while creating batch files, xml, unix scripts. So I was searching for one with Essbase calc script based highlighting and ended up creating one!!! Click start, run, type (or paste in) %APPDATA%Notepad++ (this will be the folder where you have config.xml) then click ok.
Open userDefineLang.xml with a text editor. If it does not exist, simply download/save the one you downloaded to this folder and rename it to userDefineLang.xml, you’re done! If you have an already defined User Language, open the file with your favourite text editor (such as notepad++ or notepad). FIX….ENDFIX IF…ENDIF will now show up as block, you can just use the expand/collapse buttons (+/-) to group them. Brilliant. I use Notepad++ all the time. Is anyone working on an MDX language support (hyperion version/std not SQL Server) ??? That's a nice feature, thank you pointing it out. You can soon except something similar in Notepad++. I'm working on it and will let you all know once it is done. I actually never knew about the folder option and I added it into my style. Thanks for the tip. Love this, thanks. Anyone out there have one for DRM formulae? Didn't work for me. I downloaded the file and copied into the Notepad++ folder. restarted Notepad++. Essbase doesn't appear anywhere. After adding your file I renamed it to UserDefine.xml and placed it under the folder mentioned in your post. The folder also contains a file called Langs.xml. After restarting my notepad++, I'm can see "Essbase calc", "Essbase MAXL", "Essbase MDX" under Languages option. However the highlighting/ color of the calc script doesn't change when i select "Essbase calc" language. What am I missing here ? Your xml wonderfully syntax highlights calc scripts in Notepadd++ v6.9.1! Thanks for sharing your hard work with the rest of us. May your generosity be repaid ten-fold. Thanks for putting this together, I use it all the time!